Two coats of Finger Paints' Sparkle and Snowflake to start. 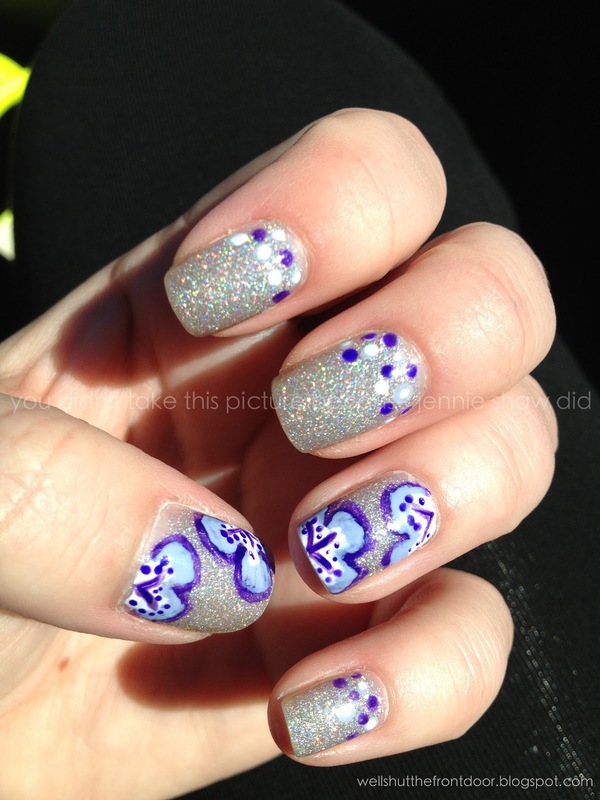 Then I used Julep's Eden and a thin nail art brush to outline the flowers. ORLY's Harmonious Mess filled in the rest of the flower and Finger Paint's Paper Mâché for the centre. With a even thinner brush, I did the centre lines in Eden and then got a small dotting tool for the specks. Originally, my other nails didn't have any details but they looked naked, so I added dots of Eden and Paper Mâché to bring everything together. I just LOVE how insanely sparkly the base coat is. When the light hits it, it's like: WHOA! NOW THAT'S SOME SPARKLE! I really wanted to have the brush strokes from the Pinspiration picture but as much as I tried, I just couldn't make them line-y and not blob-y. Oh well! Haha! Unrelated Side Note: Click here to enter my giveaway for a bottle of Initialiste by Kérastase, which has totally transformed my hair! lol that is some sparkle! That base coat is really really pretty! This came out so cute. I love the polka dots at your Moons.. The purple goes great with the Glitter. Sorry I'm so late making my rounds!